Catania, 이탈리아의 오스텔로 데글리 엘레판티 | 호스텔월드에서 예약하세요. 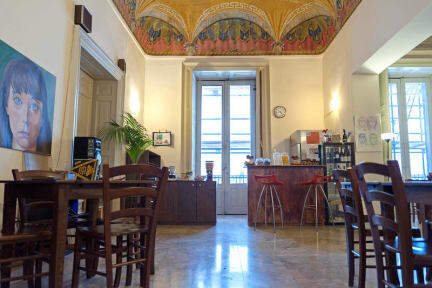 perfect location : easy to take a bus to the airport, city center, close to pubs/local market rooftop is really nice. although you should book a table even if you’re a guest of hostel. but the view over there was worthy it. terrace was always really nice to enjoy catania. staff were so kind, friendly, helpful and fun. it’s quite old building so toilet and bathroom weren’t than clean actually. except this, everything was perfect. so i extended seven days more after staying one night there! 위치가 어우~~~ 위치만 보면 여기가 무조건 짱! 두오모 바로 앞!! 침대 2층은 좀 높아서 불안해 보였고, 콘센트랑 개인등도 제대로 없었어요... 다행히 전 사람이 별로 없을때라 1층에서 지내서 불편함 없이 잘 있었어요! 다 좋은데 2층침대 진짜로 무너질것 같다.. 누워있다가 앉았는데도 휘청휘청~ 나머진 정~~~말 좋다!